Here is another episode of EXCHANGE, Neil’s radio show on CJAD. This episode talks about reincarnation. When I was growing up in ‘the dirty thirties’, the depression years; in the lovely tourist village of Hastings nestled in the picturesque valley of the Trent River, we didn’t have a radio in our home. Most of our neighbours had one. But we didn’t. And it bothered me. I’m not sure why we didn’t have a radio and so missed out (my brother, Stafford, and I) on a lot of programs our friends listened to and talked about. Certainly, it wasn’t because my father Arther McKenty (also known as ‘A.J.’) couldn’t afford one. Although I was continually worried we were about to plunge into poverty (as I have explained at greater length in my memoir, THE INSIDE STORY, published in 1997) , the fact was my father was a reasonably prosperous hardware man and tinsmith. He was careful with the family budget but he certainly could have bought us a radio with lots of black ink to spare. Why didn’t he? Why were we made to feel different because we didn’t have a radio? I think the reason had something to do with our religious background and especially my father’s attitude to some elements of his religion. We were staunch Irish Catholics living in a strong Protestant (not to say loyal Orange) Community- Liberal in many ways, including politics (my father invariably supported Mackenzie King and since King’s Liberals almost always won, my father seldom lost his vote). Neverthless my dad had developed a puritanical, almost a Jansenist virus, in some of his religious attitudes. Dancing and films were, depending on the circumstances, suspect (although my parents often enjoyed both). So was the radio because radio introduced into the house, in my father’s view, a non spiritual, materialistic, even anti-religious atmosphere that dad considered dangerous at least for my brother, Stafford and me. There is some evidence that this is not just speculation on my part because the event that changed my dad’s position was the fact that radio began to carry some religious programs, strongly Roman Catholic to boot. Who can forget the impact that the famous radio orator, Monsignor Fulton Sheen from New York, made on the airways in the thirties? Or at the very least, what Irish Catholic can forget? (Some years later Monsignor Sheen transferred his formidable oratorical talents to television where he quickly became so popular that he dethroned Milton Berle, till then the king of television). In any event, we have Monsignor Sheen to thank for introducing our very own radio into our house. And I can still remember the hair standing on the back of my head as I heard his mellifulous voice reverberating around our modest livina room. Mind you, our radio- listening was still severely rationed. But now as Christmas approached we did not have to sneak over to our neighbours, the Cruickshanks, where we would listen to the Timothy Eaton holiday programs leading up to the big Santa Claus parade. And soon there was another program that if my father had his way, we never missed. Wouldn’t you know this was another clergyman, known as ‘the radio priest’. Father Charles Coughlin, quite another cup of tea, I might add, than Fulton Sheen. Charles Coughlin was born in Hamilton, taught as a priest at St. Michael’s College in Toronto and eventually fetched up at the Shrine of the Little Flower, in Royal Oak, Michigan, not far from Detroit. He had a voice like an organ, soothing, rich, mesmerizing and he played your emotions the way a maestro conducts an orchestra. And he was a maestro, no doubt about it. And every Sunday afternoon about four o’clock my dad and the rest of us turned on the radio expectantly waiting the oritund velvet tones of Charles E. Coughlin, the radio priest. The trouble was not Father Coughlin; the trouble, though I am sure I did not realize it then, was his message. Father Coughlin’s world view was straightforward enough. By and large our planet was run by a small clique of men (I’m sure there were no women in the group) whom Coughlin called international bankers, most of whom were Jews and some of them communists at that. If we could only smash the international bankers, their Jewish lackies and their communist fellow-travellers, the kingdom of peace, justice and Jesus Christ would begin to emerge on this earth. If those remarkable Catholics – Mussolini, Hitler and Francisco Franco – could help us smash the dirty little Jewish conspiracy to run the world – well, that was fine with Father Coughlin. (He had started out as a friend of President Franklin Roosevelt but eventually bitterly split with him) . It would not be totally unfair to put Coughlin, Louisiana Governor Huey Long, the fiery southern Baptist Minister, R.K. Smith and the famous flyer, Charles Lindbergh in the same boat when it came to naivity about the nature of fascism. Because when you stripped away all the religious veneer from Coughlin’s phillippics what you discovered was a small-bore fascist, a bigot and a full-fledged anti-Semitic. I have no doubt mv father agreed with most of Coughlin’s diatribes. Mv father was a fair man and he was not a bigot. But he believed the bia shots of this world walked all over the little guy and there was damned little justice for anybody who lacked a fat bank balance. It was this element of Coughlin’s brew that clicked into mv dad’s own experience of life. If Coughlin was for the under-dog, whatever that means, that was alright with my dad. It was not alright with an increasing number of Americans from President Roosevelt on down. And, when the second world war began, the powers that be, in Washington and the Vatican, began to turn the screws on the radio priest. Eventually, the Archbishop of Detroit managed to force Coughlin off the air, to silence him, as the phrase was in those days. To his credit, Father Coughlin remained as the pastor of the Shrine of the Little Flower and obediently kept his mouth shut to the obvious relief of his superiors, the President and all right-thinking people of whom my father, on some of these issues, was not one. 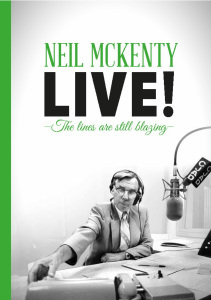 This is a collection of colourful stories and articles, by and about Neil, highlighting his radio talk-show and his writing ability. Includes some unpublished pieces and Aislin cartoons. SHOULD A BABY BE THE PRIZE? But the station has also been deluged with angry listeners who say it’s inappropriate to use a baby as a commodity.It’s like putting a baby in the same category as a car or trip.